When distributing a PDF file, you may need to black out some of its contents before it’s suitable for public viewing. The section in question may be private, or for internal use. In some cases, redaction is used to remove information about accounts or individuals’ personal information, or to black out images you don’t want to circulate. Data protection and privacy are important issues in any business, and the consequences of a lapse can be extremely serious. As such, it’s important to make sure the blacking out tool you use is robust and completely removes all traces of the content you’ve blacked out. You have two options: either delete the content and reformat your entire document, or find a PDF editor with a redaction feature. Adobe Acrobat has a redaction tool, as does Infix PDF Editor. In this article, we’re looking specifically at the benefits of the Infix redaction tool. Redaction is a standard feature in the Professional edition of Infix PDF Editor. It performs a number of functions that will help you maintain privacy and ensure information isn’t accidentally distributed in your PDF file. The main thing you’ll notice about redaction is the blacked out appearance of text. 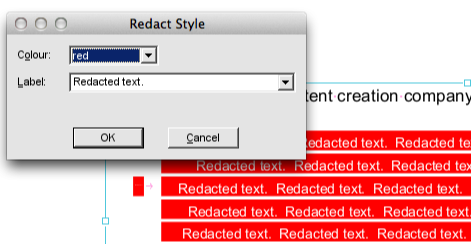 In Infix PDF Editor, you can actually change the colour of the redacted content using the Redact Style menu option. Again, under Redact Style, you can label the redacted text. This inserts a word or phrase of your choice through the redacted block. You can see an example of this in the screenshot below. In Infix PDF Editor, redacted text is completely removed from the document’s metadata. That means there’s no way to extract it from the hidden section of the file. Infix’s redaction tool can completely and permanently wipe redacted text from your document’s bookmarks and any comments in the document. First, remember that redaction is not the same as changing the background colour of text. Changing the background colour isn’t a safe way to hide content; the user could simply highlight a paragraph, copy it and paste it into a new document to reveal the characters, or find the ‘hidden’ information by searching. There are quite a few examples of high profile redaction gaffes where this technique was used. Here’s a video showing how easy it is to get around this kind of blacking out technique. Instead, when text is blacked out in a PDF using redaction, it’s removed completely and permanently. There’s no way to retrieve it. While you’re editing your PDF in Infix PDF Editor, you can undo a redaction while you’re still editing in that session. As soon as you save the file, your changes are committed forever. You don’t need to apply the redaction: it’s all done for you. Take care with this. You can lose large chunks of a document if you accidentally redact the wrong thing. It makes sense to save your PDF with a new file name before you start redacting its contents. Once you’ve thoroughly checked the results, you can dispose of the original if you need to.